IFA 2011 will officially start today (2nd of September) in Berlin until the 7th of September. But Toshiba has already showcased some of its products including the media player Toshiba STOR.E TV PRO powered by Rockchip RK2918 processors (ARM Cortex A8). This media player will allow any television with an HDMI port to have all the features of recent smart televisions. The STOR.E TV PRO has one HDMI output (1080p), 3 USB 2.0 ports, an Ethernet port, Wifi support, Bluetooth support (for the remote), a USB device port and a 2-in-1 card reader. Both sides of the remote can be used, there is a “dumb” side (my words) with 2 buttons and the arrow keys and the other side features a full keyboard. The set-top box will have the usual features such as video playback, picture display, music playback and web browser (based on webkit) with Adobe Flash Plugin 10.2 support. But it also has a video conference option that will be made possible later on via a camera connected to the USB port. It can also act as a DLNA/UPnP server and has obviously access to Toshiba places online platform. The device will be available by the end of Q4 2011. No pricing is currently available, but as usual we’re assured that it will be “competitive”. You can watch the video interview and demo at IFA 2011 if you are interested in the device. 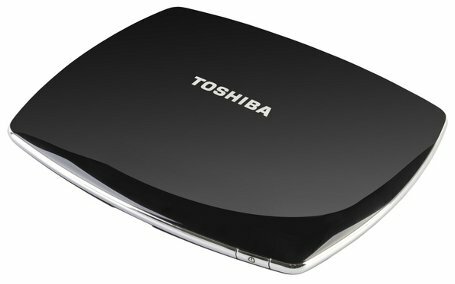 You can also visit Toshiba STOR.E TV PRO page for more details about this media player. GOCAL – Europe brings you Android Tv with the same specs and more models. Previous PostPrevious Toshiba AT200: OMAP4430 Honeycomb Tablet.